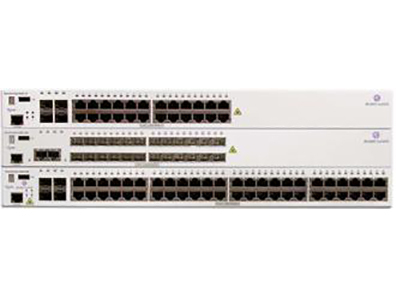 The Alcatel-Lucent OmniSwitch™ 6400 Stackable LAN Switch is a layer 2+ Gigabit Ethernet LAN switch addressing the small and medium-sized business needs for converged voice, data and video networks as well as residential and business Ethernet access service providers’ requirements. The 6400 runs the ﬁeld-proven Alcatel-Lucent Operating Software (AOS), providing an outstanding edge solution for highly available, self-protective, easily managed and eco-friendly networks. Solutions that will beneﬁt from these versatile LAN switches include SMB converged networks, remote workgroups, metro Ethernet access for residential/metro triple-play applications. Always-on robust infrastructure, optimal response time for users and applications, investment protection. Edge network security and control allowing business continuity and preventing network outages. Scalable and versatile conﬁguration with effortless deployment meeting SMB, branch ofﬁce or service providers preferences. Choice of 24 ports, 48 ports power over Ethernet (PoE) or non-PoE, and ﬁber models. Scalable from 24 to 384 ports via high speed stacking. Supported by Alcatel-Lucent 2500/2700 Network Management System (NMS) and 5620 Service Aware Manager (SAM)* applications.